In late 2010, after hearing about an ambitious, customer-centric new kind of bank calling itself BankSimple, I entered their waitlist for an account. Their manifesto promised an absolute minimum of fees! First-rate online and mobile experiences! Friendly support! It would be one-and-a-half years before they opened up to their first non-employee user. So it was in July 2012, three apartment moves and a hop to California later, that I received my invitation and opened an account, even as Dustin Curtis wondered if it was all an “elaborate hoax.” I found Simple to be truly different and dramatically better than most banks in many ways. An online-only bank, it did have some drawbacks (which I’ll get into soon). I recommended the bank to friends and family, winning some converts, but I also carefully noted that while Simple was my primary account, it could not yet be my only account. I kept my local credit union account open. I need to note that, at its founding, BankSimple was not truly a bank; Bancorp was their partner bank, actually providing accounts, routing numbers, and debit cards. However, all support, interfaces, and branding were Simple’s. In the next two years, BankSimple renamed itself to Simple and was acquired by (actual bank) BBVA Compass. To this day, Simple’s experience and customer support has always been top-notch, just as promised. (Seriously, thank you to the team at Simple for always answering my questions and helping me out via both in-app messaging and phone!) The mobile app was continually updated and improved. But not much else changed, and to date, no progress has been made on the areas of most concern to me, which I will describe below. In October 2016, I opened accounts with Ally in order to escape the limitations of Simple and to earn interest on my deposits. My decision was bolstered by friends’ endorsements of Ally. Ally and Simple are online-only banks: There is no branch to walk into. My comparison will draw on my experience at both so far. Wait, why Ally and Simple in the first place? What’s wrong with Chase, Bank of America, Wells Fargo, and the lot? That’s a story for another day, but you should already know that most of the big corporate banks (especially, infamously, Bank of America and Wells Fargo) have, in their recent history, committed fraud against their own customers, often with heartbreaking consequences. I find myself morally averse to sending any profit towards the unethical executives running these behemoths. Ally and Simple, in contrast, have consumer-friendly policies, clear communication, and minimal fee structures. Instead of playing “gotcha” with hard-to-avoid fees, these banks seem to be on our side — like credit unions, but with better tech and compelling advantages! These are the major pros and cons of each bank, as informed by my experiences. Simple boasts the best-designed web and mobile interfaces I have ever used, bar none. I mean this both aesthetically and functionally. Upon logging in, I am greeted immediately with my “Safe-to-Spend” balance, available balance, and recent transactions. This is precisely, exactly as it should be. I don’t think I have ever tried to do something on the mobile app only to find that I had to bust out my laptop. Simple gets it! Their mobile app even integrates with 1Password and similar password managers, although I rarely need this feature thanks to the app’s support of Apple TouchID, which seems standard for most banking apps these days. 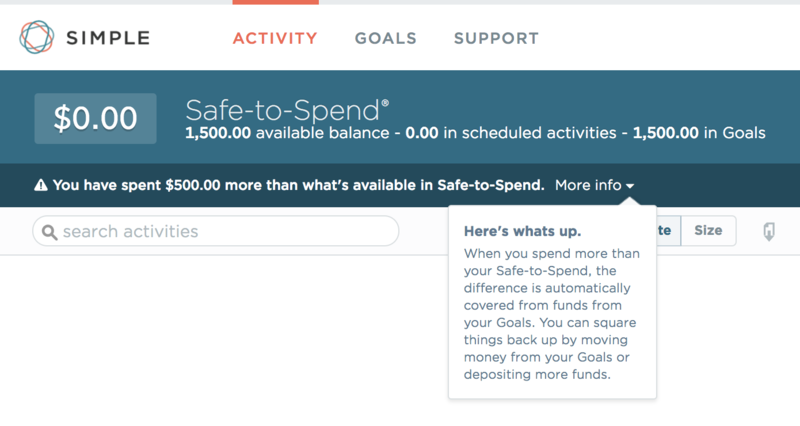 They make saving and setting aside money very easy with their “goals” feature, which is a lot like having lightweight extra little accounts with names like “Vacation 2017,” “Down payment,” or whatever. Unlike an actual account, however, the money is not really moved out of your primary account; it just looks like it’s subtracted. By default, goals take a little bit out of your Safe-to-Spend balance every day so you can have all the money saved up by your target date. I love getting native iOS push notifications for deposits and other transactions in my Simple account. They keep me informed even as they save me a trip into the app. Customers can make truly instant transfers to other Simple account holders (such as family members). As I recall, this saved my bacon once when my account was running on fumes and my brother loaned me enough to cover a bill that needed paid right now. I simply sent him his money back a few days later. The best customer service of all time: Friendly. Low friction. In-app and over-the-phone. Helpful. Accurate. Quick. Free from garbage hold music. Theirs is an example to strive for. If I had a problem with the transaction below, I could click “Support” and start a conversation about it. I’m already authenticated, so I would just type a sentence or two and hit “Send.” Soon, I would get a push notification heralding an agent’s response, which I will view in-app (or online). It could’t be any more seamless. Simple’s focus on empowering customers via many small design choices is really great. For example, you can freeze or change the PIN on your debit card right in the Simple app on your phone. When Simple detects the little deposits and withdrawals that other institutions make to verify an account, they proactively let you know, so you can complete the process. Lovely! Not all see this no-check policy as a disadvantage: My brother agrees with Simple that checks are insecure and appreciates the company’s overall commitment to security. The lack of interest is compounded (pun intended) by Simple’s lack of a savings account option. Yes: There is only one type of bank account Simple offers, and it is a checking account with no checkbook. While I can usually find a fee-free ATM to use (which Simple makes, er, simple via their mobile app), Simple does not refund charges from out-of-network ATMs. Completely free checking! Even check re-orders are free. Customers can send checks online (as on Simple) or via physically writing checks. Use any ATM, even one that charges fees (say, at a bar or local bank), and Ally will refund you! This is subject to a reasonable monthly limit (currently $10). Ally claimed in 2015 that 89% of customers do not hit this limit. I suspect that if you are hitting the limit, you could probably plan a little better or find a free ATM. Fee-free overdraft protection, wherein money is transferred from your high-interest savings account to your low-interest checking account to cover a shortfall in that account. Excellent for peace of mind! The mobile app is limited. Twice in my first month as a customer, I called in to inquire about a feature I couldn’t find, imagining it may not exist, only to be told that the functionality exists but only on a full-size computer. The app doesn’t have any push notifications to configure. In fact, the app generates exactly one (annoyingly unnecessary) notification. Thankfully, SMS alerts are available and configurable. That said, I have received texts for transactions and opened up the app for more information (as the alerts include amount, but not merchant) only to realize that the transactions were not listed yet! However, they appeared a few minutes later when I tried again. This really shouldn’t happen. Aesthetically, Ally can’t quite hold a candle to Simple. This is disappointing but hard to justify caring about when deciding between the two! Unfortunately, the design choices are weak from a functional or user-experience perspective, as well. Recent transactions are buried behind a second click or tap and a subsequent wait for the transactions to load. 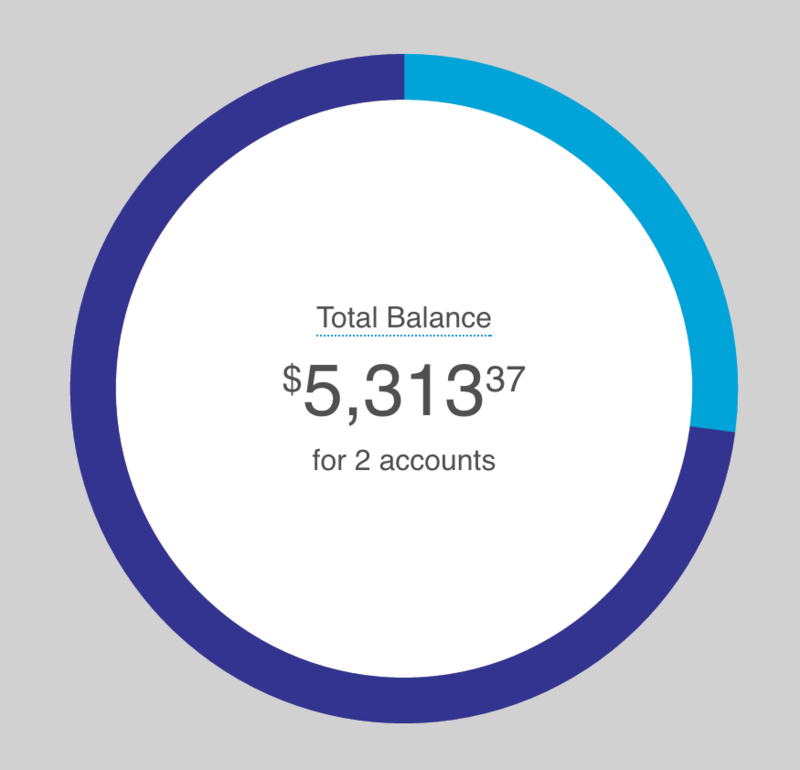 Their interfaces’ default views show this huge donut graph that is nearly devoid of information. If I want to know if my checking account has more or less than $1800, this chart, for all of its pixels, does not tell me. Wouldn’t it be much better to show, say, a line chart of balances by account (and in sum) over the last 30 or 60 days? Their donut graph is a good example of something being so “simple” that it’s useless. Tufte would weep. So far, their customer support has proven very friendly, but decidedly more frustrating than Simple’s. When I never received my debit card, I called for a replacement, which also never came. Calling a third time, the agent helpfully confirmed that the previous agent had failed to actually send a card despite promising to do so! When my card finally arrived, it arrived at my home address, despite my request that it be sent to my office; I did this because the agent told me I would need to sign for it on delivery, which ended up being untrue. The FedEx envelope was left at my doorstep, which was fine in the end. Experiencing three customer service failures before even receiving my debit card has shaken my trust in Ally somewhat. Whenever I call their support, there is a somewhat lengthy phone verification process in which I must regurgitate all sorts of personally identifiable information (last four digits of SSN, mother’s maiden name, and so on) and answer a custom security question. Given that I am calling from the number associated with my account, I’d rather answer only my secret question. No maintenance fee, minimum balance, or direct deposit is required for their free checking accounts! You can have Ally or Simple mail a check for you. Both sport a customer-centric focus and 24/7 call centers with zero-minute wait times. Unfortunately, both banks have serious limitations due to their online-only nature. It is not easy to get cash into your account. This may or may not be an issue for you, personally. A work-around is to deposit the money into another bank account and then transfer it to Ally or Simple. You can also convert the money to a cashier’s check or money order, but I consider the incumbent fees a waste of money. Similarly, large checks will need to be mailed in instead of deposited via a smartphone scan. A friend and long-time Ally customer reports that it took two or three weeks for his large check to finally be deposited after he sold a house. I don’t know how long it would take Simple. (Again: This is why I also have an account at a bank or credit union with a physical branch to walk into.) This should be rare, though: Ally accepts checks as high as $50,000 via mobile deposit (for accounts in good standing), which they say is the highest in the online banking industry, and much higher than Simple’s $3000 limit ($2000 for new accounts). Pushed by a coinciding change of address on my part and Simple’s one-time switch from a partner bank to being backed by now-parent company BBVA Compass, which unavoidably changed my routing and account numbers, I am switching to Ally as my primary bank. (For me, this dictates where most of my paycheck is deposited, where my credit cards and insurance companies pull from for AutoPay, and where I hold any happy extra cash.) I am still keeping an open account at a physical bank as well. To be clear, the switch of backing bank was only a nudge, not a reason for my switch. I had already been convinced by Ally’s interest rates, checkbooks, and ATM fee refunds, and by my limited experience at Ally since opening my accounts there in late October. By moving my “rainy day” money from a Simple “Goal” to an Ally savings account, I’ve increased my interest rate by 100×. I can’t say no to that. In December 2016, I sent both banks’ PR departments a draft of this post. Simple made no comments on specific features or changes they have planned, but they stressed that 2017 will be “a year of product growth” that will include “big changes to Simple.” They are in the process of rolling out a major feature for couples, shared accounts, with all of the thoughtful design we all expect from Simple. Ally alerted me to an early-January 2017 release of a major website design that proved to enhance both design and usability. Since these changes arrived before I published this comparison, I removed a paragraph critical of Ally’s website. It’s good to know neither company is sitting still. I will be watching how both products evolve and improve over the coming years. I hope this was a useful comparison. If you find that I have overlooked something, or even if you simply found this article helpful, please let me know. Thanks to Richard Feldman, Greg Hogan, and Catherine Hogan for reading a draft of this comparison.